VirWox Affiliate Payment Received - Earn Linden Dollars With VirWox - KABALYERO - PLAY, BLOG & EARN! VirWox Affiliate Payment Received, earning Linden Dollars is easy with VirWox. Four days ago, I received 902 Linden Dollars from VirWox. It was payment for referring Second Life Residents to buy their Linden Dollars from VirWox. For those of you who don't know, VirWox is a third party Linden Dollar Exchange authorized by Linden Lab to sell Linden Dollars to Second Life Residents. As an Affiliate, I get a very small commission for referring Second Life Residents to VirWox. 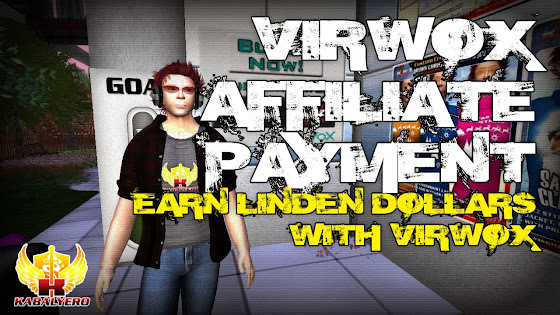 So, if you are an active Second Life Resident who is looking for an easy way to earn Linden Dollars then why not become a VirWox Affiliate and refer your friends to VirWox. The link to join VirWox is in the description of the video below or you can simply click here.